I’m just gonna come right out and say it: 2015 pretty much sucked. Very little went the way I hoped it would, and I definitely got thrown some major and awful curveballs. Luckily, 2015 is almost over and a new year is around the corner, and with a new year comes new opportunities and new chances. However, I don’t want to end the year on a negative note, so I thought I’d look back through the better times of 2015… through pictures. 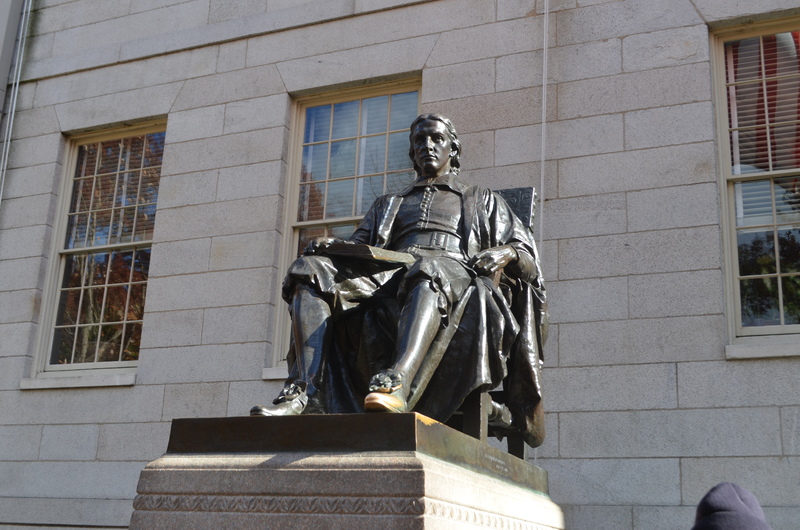 They say if you rub the foot of the John Harvard statue, you’ll have good luck. And for good reason! Harvard University has an admissions rate of less than 6 percent, a number that makes it one of the most difficult colleges in the country to get into. I first visited the crimson-colored campus in November of 2013. It was my first time seeing the warmly-colored Boston leaves—the only “warm” thing in the city, aside from the Starbucks and Dunkin’ Donuts on every street corner. I’d always imagined that, if I visited, I’d see Ivy-coated walls and lots of people wearing glasses (because that’s obviously a sign of smartness). I didn’t end up seeing any Ivy-covered walls and most people didn’t wear glasses. But I did find something else instead. All of these photos were taken on July 23, 2014 at the Top of the Rock in Manhattan. After fighting my way to some of the more optimal spots and waiting around for hours and even getting rained on, I was able to get these pictures of Manhattan at dusk, during sunset, and after dark. New York City truly is one of the most beautiful, interesting, and breathtaking cities in the world—a city ripe with dreams and opportunities. Hopefully you can get a glimpse of it through these photos. For my photo blog of Times Square (that includes a short video panorama), click here. On May 24–25, the Thai community and Buddhist Center of Dallas celebrated their first Thai Culture and Food Festival. I love when different groups open and share parts of their culture, so it was really exciting to have the Thai community be willing to open up to the rest of Dallas to share their food, music, traditional dances, and even their Buddhist temple. And even though this was the first time the Thai community has held a cultural festival at the Buddhist Center of Dallas, it was definitely a success. As soon as I walked in, I was surrounded by tons of tents selling all sorts of food. Sunday was my first day—well, more like “night”—in New York. And, despite only going from about 7pm to 11pm, it was actually very eventful! I got the chance to meet my aunts, uncle, and cousin, all while looking over Times Square! It was beautiful, and I couldn’t have asked for any better way to start off my trip! Times Square was absolutely breathtaking. I can’t even begin to describe how crazy it is. But it’s a good kind of crazy, and I love the hustle-and-bustle of the area… even if its only tourists like me who are hustling-and-bustling. What’s absolutely crazy is that you don’t even realize it’s nighttime when you’re there. All of the flashing lights and advertisements fool you into thinking it’s daytime! And there’s got to be an ad for everything imaginable. With so many ads flashing around me, I almost want to just pull out my wallet and wave my credit card in the air and just let the consumerism, well, consume me. It’s capitalism at its finest. Lots of photos after the jump! Last month, I spent a weekend in San Antonio. Only about an hour away from the capital of Texas: Austin—the city known for its eccentricity and vegetarianism, and more recently its fight to protect women’s autonomy from (an arguably) crazy governor. San Antonio, however, is an area with a heavy Mexican influence, in case the name “San Antonio” didn’t already tell you that! The entire city brims with that Latin flair, that excitement and passion that Latin cultures always have. Even though that weekend was supposed to be my break, I felt the itching need to do something. Really ANYTHING outside of the hotel! But my curse of not being able to sit down and rest turned out to be a blessing, since the San Antonio Market Square turned out to be an incredibly vibrant place! From live music to street vendors to indoor stores selling art with a Mexican flair, how can you go wrong? Let’s get real. There’s nothing more colorful than the beauty that is… les macarons.